I am not an expert on okra. Nor am I a true Southerner. My father-in-law showed up the other day with fresh okra, tomatoes, and squash that he had picked from the garden. My only memories of okra as a child were not good ones. My grandpa had a huge garden and he grew everything imaginable. I mean everything. The only way he ever served okra was stewed. It was gluey, it was sticky, it was gross. Therefore, okra disappeared from my life for awhile. Then, I married a Southerner. He loves fried okra. I have learned to like it and have made it a couple of times. Only on special occasions- like his birthday, or when someone is visiting or something like that because I don't like to fry food at home. So, with all the okra I received, I didn't know what to do. 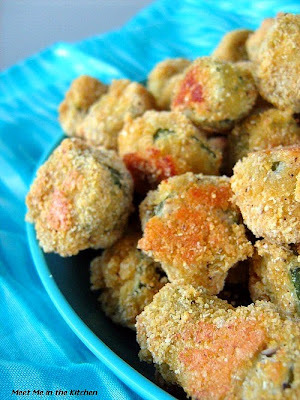 I started looking through cookbooks and found this recipe for Oven Fried Okra from Cooking Light. It sounded good and I was very curious to see how it would compare to the usual fried kind. You slice the okra, soak it in buttermilk, then dredge it in cornmeal, which has a hit of cayenne, and oven fry it for about 40 minutes. I thought it was good. Not as crunchy as fried, but still good. My kids and hubby liked it too. If you do make this, make sure when you are dredging the okra in the coating, that it doesn't get on there too thick. That happened to some of my pieces and they were a little dry. I thought this made a good snack and was a nice alternative to fried okra. What do you do with okra? If you have a fave recipe, please share! 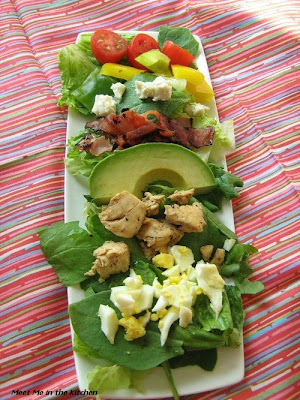 This week's Craving Ellie in my Belly recipe, Cobb Salad, was chosen by The Feast Within. 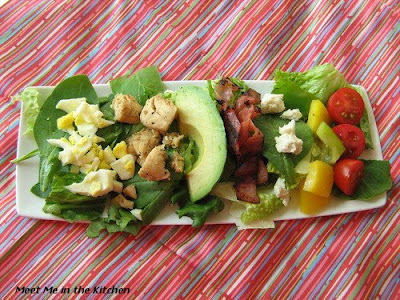 I haven't ever made Cobb Salad before. I decided I would serve this when my dear friend came over for dinner with her 3 kids. I prepped all the different ingredients- chopped cherry tomatoes, blue cheese, avocado, crispy ham, bell peppers (not called for in the recipe, but I had some, so I chopped them), cooked chicken, chopped hard-boiled egg, and placed each of them in a little bowl with a serving spoon. Then, I mixed the romaine and baby spinach (the recipe called for watercress) and placed them in the center of the table. I let everyone "make" their own salad and dress it with the delicious dressing if they wanted to. My hubby thought the layout on the table was really pretty and asked me if I had taken a picture of it. I didn't, but I was impressed by his comment. Thanks, honey! I instead took a pic of an individual serving, minus the fabulous dressing. This was a really great dinner. Everyone was really happy with the salads they created and I found out my 4-year old loves blue cheese. Check out the CEiMB Blogroll to see the other tasty salads this week! 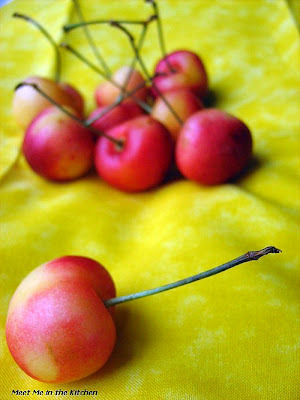 Recently, she has been begging for these beauties- Rainier Cherries. They are a little expensive, but I like it that she wants healthy foods, and I saw a buy 1, get 1 free sale, so we got 2 containers. 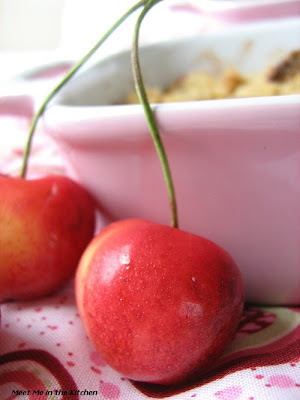 There was a recipe in the July issue of Cooking Light for Rainier Cherry Crumble. In the back of the magazine, at the bottom of the index, there is a little section where the magazine lists the "Greatest Hits" of that particular issue. 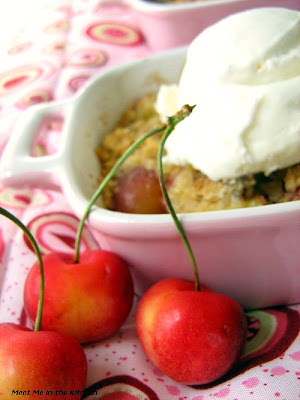 The Rainier Cherry Crumble was a greatest hit, so I went for it. 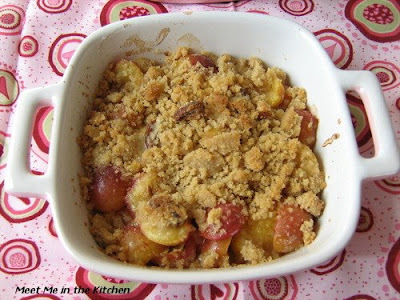 I decided that since there are just 2 adults and 3 kids at our house, we really didn't need the full crumble, so I made 1/4 of the recipe. I also had these really cute mini dishes I wanted to use, so making a smaller amount worked perfectly. I unpacked my ice cream maker, and remembered a great post by Nancy about David Lebovitz's Vanilla Ice Cream-Philadelphia Style- which means, no egg yolks involved. 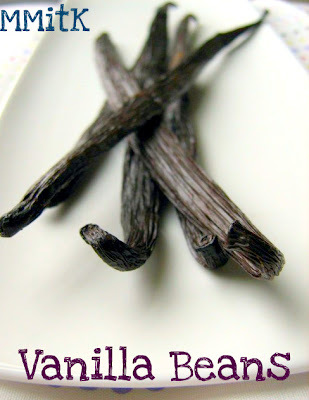 You steep the vanilla bean in the cream, meanwhile dissolving the sugar, and then it cools in the fridge for awhile. 30 minutes later, you have this stuff. One of the other great things about this recipe, is that you don't add any sugar to the filling- just a little cornstarch and fresh lemon juice. 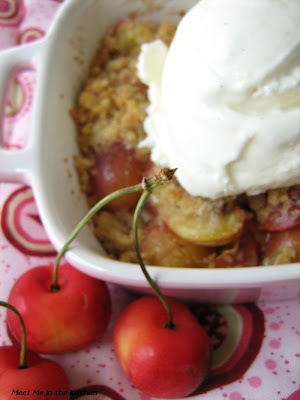 Sometimes warm fruit desserts, like crisps, cobblers and crumbles are too sweet for me. This one was perfect. 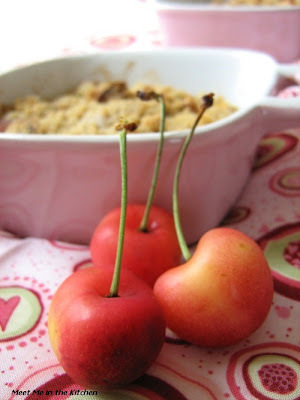 The cherry filling was slightly tart, with the topping adding the perfect amount of sweet and crunch. The ice cream was fabulous. I used some of the leftover ice cream to make root beer floats- Yum! 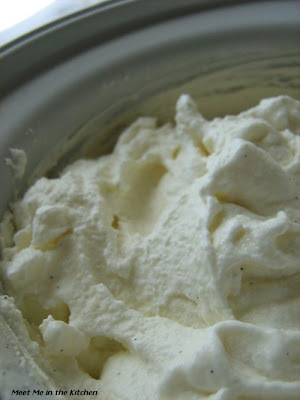 The ice cream recipe says that you can use either all cream or a mixture of cream and whole milk, which is what I used. I highly recommend both the crumble and the ice cream. My husband ate an entire little pink dish full, so the kids and I split the other one 4 ways. I figure eating 1/16th of a Cooking Light recipe really can't do that much damage. I hope. And if it does, it was worth it. Tuesday's with Dorie- it has been awhile. I haven't participated yet in July but I did make the Vanilla Ice Cream that Lynne of Cafe Lynnylu, chose for this week- last year. And now that we are all settled in our house and I feel close to organized, I will be able to get back on track with baking and posting for TWD. I made this ice cream last year when we made Dorie's Chocolate Chunkers for TWD, because Dorie suggested churning the cookies into her Cinnamon Ice Cream, which is a variation of her vanilla ice cream. And I had 6 egg yolks hanging out in the fridge, leftover from making a meringue of some type. My sister loves all things cinnamon and I remember her really, really loving this cinnamon ice cream. In fact, everyone who ate it loved it. It was very, very good. You can get the recipe from my post mentioned above or go to Lynne's blog and you will be able to find it. 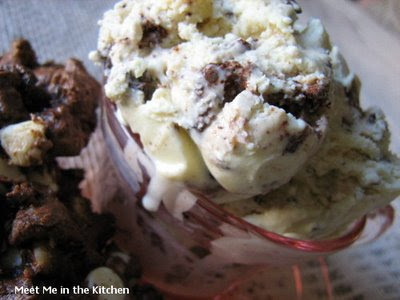 Please check out the TWD Blogroll to see what other flavors and variations people made out of this week's recipe! I also included a couple of pictures from my Perfect Party Cake back in June since I finally downloaded all my photos. That is a good cake. My husband knows how much I love to bake. A couple of weeks ago, he suggested that we take some kind of baked good to the people who were selling us their house. We got a really good deal because they had to move. We even managed to get their fridge. From the day we moved from Utah, to the day we moved into our house, I think I baked 3 things. That really isn't very many considering I was baking multiple times a week before that. I even went a whole month without baking a single thing. Maybe that doesn't sound like a big deal, but for me, it was wierd. I love being in the kitchen. Here is one of those 3 things. I baked these muffins to take to our house-sellers. They weren't home. We ate them instead. Now, this is supposed to be a banana bread loaf, but I was thinking that mini servings are easier to share, so I made muffins and I also decided to just do a simple powdered sugar/fresh lemon juice glaze instead of the cream cheese one that was included with the recipe. I didn't want to take away from the banana/blueberry thing that was already going on. To prepare the banana bread, lightly spoon flour into dry measuring cups, and level with a knife. Combine flour, baking soda, and salt, stirring with a whisk to combine. Place granulated sugar and butter in a large bowl, and beat with a mixer at medium speed until mixture is well blended (about 1 minute). Add mashed banana, egg substitute, sour cream, and vanilla; beat until blended. Add flour mixture; beat at low speed just until moist. 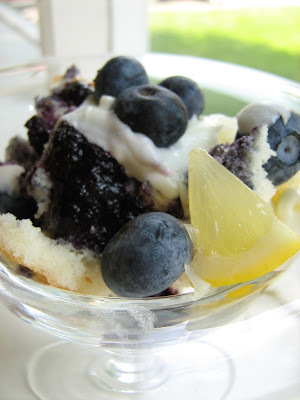 Gently fold in blueberries and lemon rind. Spoon batter into an 8 1/2 x 4 1/2-inch loaf pan coated with cooking spray or a muffin tin. Bake at 350° for 1 hour and 15 minutes or 20-25 minutes, if you are doing muffins, or until a wooden pick inserted in center comes out clean. Cool the bread 10 minutes in pan on a wire rack; remove the bread from pan. Cool completely on wire rack. 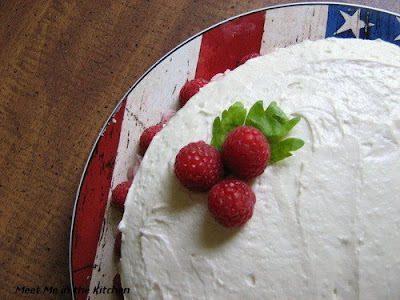 To prepare glaze, combine cream cheese, powdered sugar, lemon juice, and water, stirring with a whisk until smooth. 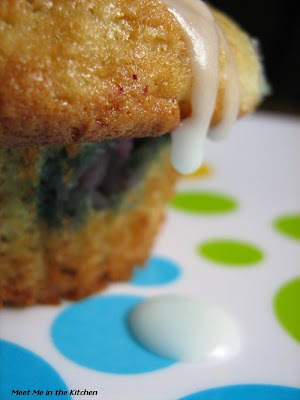 Drizzle the glaze over cooled bread or muffins. I got 17 muffins from this recipe. 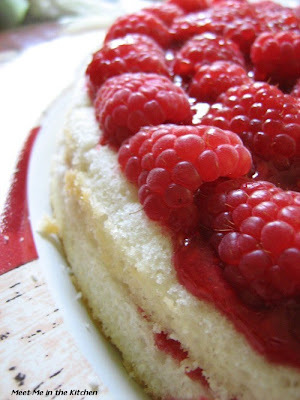 This is another recipe that I make all the time. 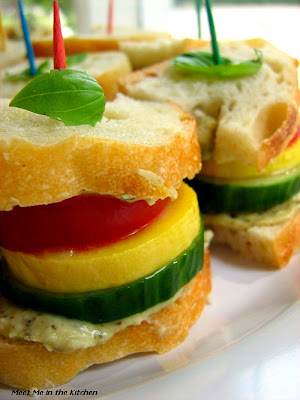 Especially in the summer, when tomatoes, cucumbers, bell peppers, and basil are ripe and easy to find. 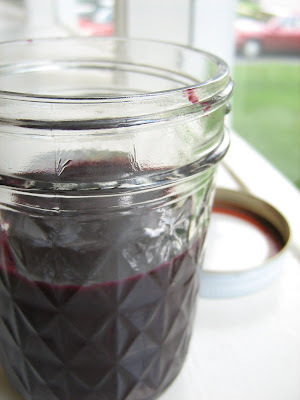 I first made this recipe last summer with the Barefoot Bloggers and I am so glad I did. I always reduce the amount of oil and instead of sauteing the bread cubes in the oil, I drizzled the oil on the bread cubes and toast them in the oven- I do whatever I can to save a few calories here and there. 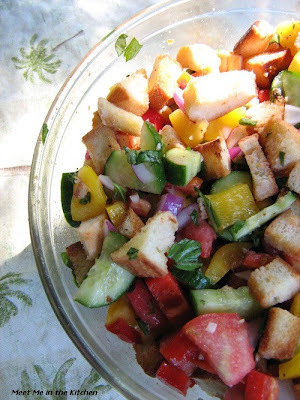 People are always a bit suspicious when I tell them I am making bread salad, which is a common name for this dish. They quickly get over it as soon as they try it. Add the bread and salt; cook over low to medium heat, tossing frequently, for 10 minutes, or until nicely browned. Add more oil as needed. Instead of preparing the bread cubes this way, I preheated the oven to 400 degrees. Then,I put the bread cubes on a jelly roll pan that was coated with cooking spray and drizzled 1-2 Tbls olive oil over the cubes. I tossed the cubes with the oil and put the pan in the oven for about 12 minutes, stirring the bread cubes once. 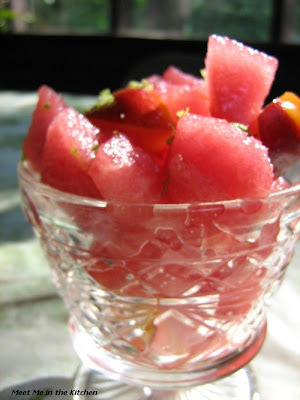 Watermelon is Sweet. Delicious. Thirst-quenching. Dessert-satisfying. 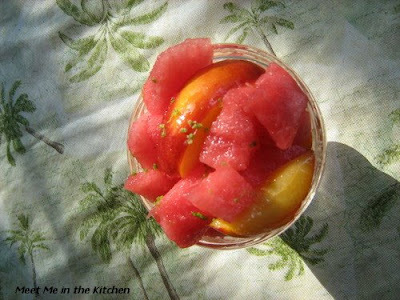 The perfect summer food. 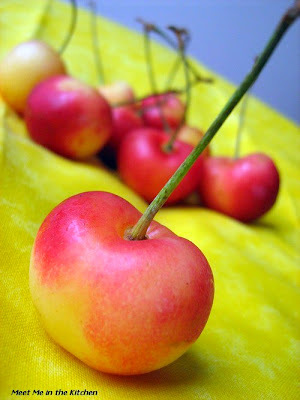 Add a few ripe nectarines, a fabulous lime syrup and you have got yourself the best fruit salad/dish/dessert. Ever. and HERE. (I replaced the photos from both of those posts with these pictures because the ones here are much better) I have made it multiple times this summer and finally got some good photos. I am posting about it again, because it is just that good. 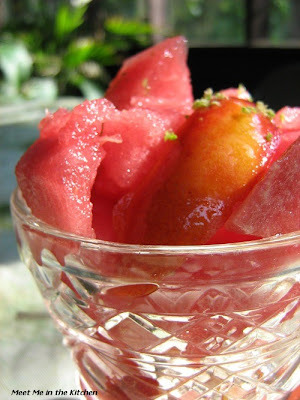 You make the lime syrup ahead of time and then, right before serving, you add the nectarines and syrup. 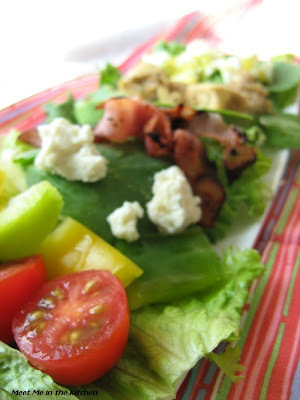 This salad is a definite crowd pleaser and it is easy peasy. 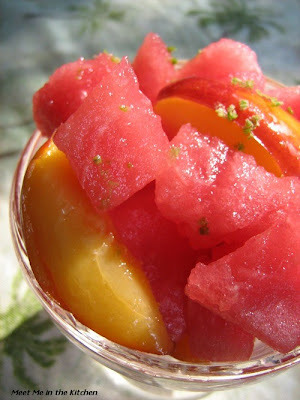 If you like watermelon at all, I am sure you will love this salad. 1. Put sugar and 4 T water in a small saucepan. Bring to a boil; reduce heat and simmer 2 to 3 minutes, stirring until sugar dissolves. Remove from heat; stir in lime juice. Refrigerate until cold. 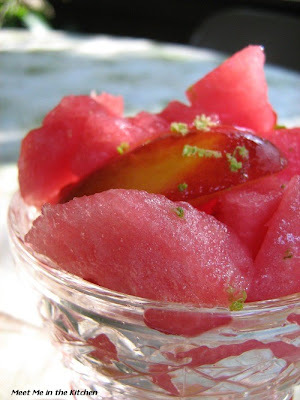 Refrigerate watermelon in serving bowl. I like onion rings. Well, more than like. I have never attempted to make them at home- I don't fry things very often. I save them for an indulgence when we go out, sometimes. 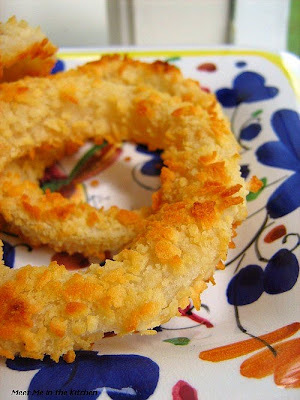 I chose this week's CEiMB recipe- Oven Baked Onion Rings. I have been interested in making onion rings, so, I thought this was the perfect chance to try them out. I didn't change the recipe at all. I made it exactly as it was printed. Sara, on the other hand, has made this recipe multiple times and has worked out a version that she prefers, which adds a few more spices to the coating. I made these on the 4th of July, for our meal that we enjoyed before we went to the National Mall to get ready for the festivities. I should have tripled the recipe. These were marvelous. All the kids LOVED them. And so did the adults. My 7 year old said, "These are better than the Varsity." Coming from a kid, who was comparing my baked rings to the greasiest ones on the planet, I thought that was a pretty impressive compliment. My kids have begged for them again and they will be making their way into my cooking rotation. 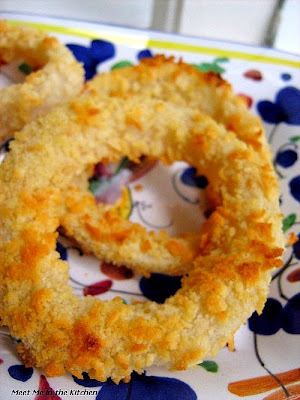 What's not to love about a onion ring that tastes great and isn't bad for you? Hopefully everyone else loved them as much as we did. To see what the rest of the Ellie's thought, go check out the CEiMB Blogroll! I also made a couple of the recipe I have missed in the past 2 months. 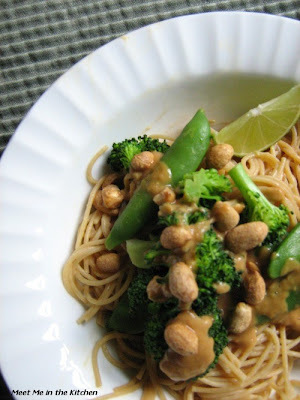 I made the Aromatic Noodles with Lime Peanut Sauce and they were good-warm or cold. 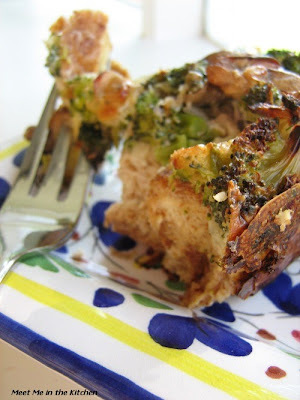 I also made the Vegetable Cheese Strata when I was in DC. We enjoyed it before we set out to hike the Billy Goat Trail. Wow- it feels like it has been forever since I actually baked something and posted about it! We are finally in our house and have internet service. Who knew it would take so long? I am a day late posting for The Cake Slice. 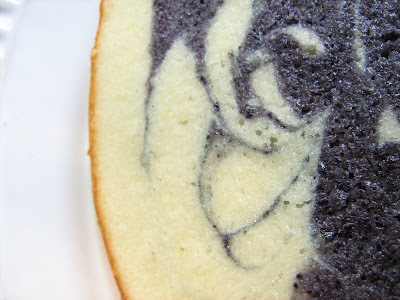 This month's cake was Marbled Lemon Blueberry Butter Cake. I made this in DC, when we were up visiting my sister for the 4th. My little nephew was so entraced with the cake layers and swirls, he couldn't stop praising my work. My sister thought she had 3 cake pans that were the same size, but after searching for awhile, I decided to make this cake in 2 8-inch pans and a springform pan. Then I just cut the layers down to the same size. 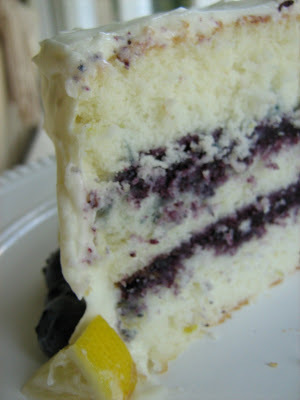 The blueberry preserves in the middle and swirled in the layers were delicious. 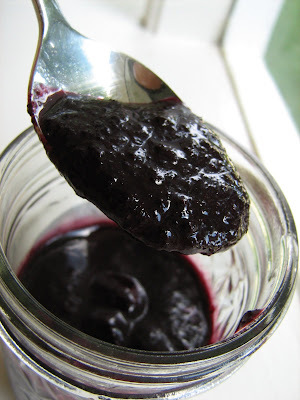 The recipe says to strain out the peels of the berries, but I didn't, because I like that part and preserves to me are supposed to be a bit chunky and full of pieces of fruit. I also used Dorie's cream cheese frosting to frost this cake instead of the frosting called for. 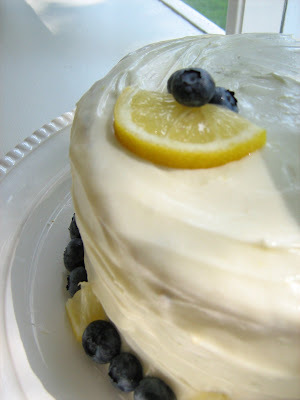 Dorie's frosting has a great lemon flavor. We had big plans on the 4th and I didn't want to be in the kitchen all day. This cake was a big hit. Everybody loved the flavors and it felt very summery. We made trifles with the cake scraps that we trimmed off. 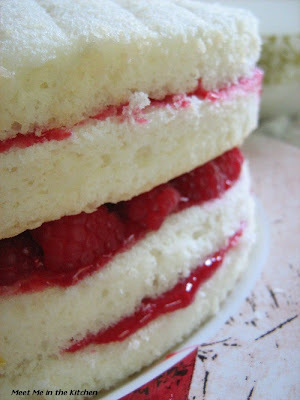 Check out what everyone else thought about this cake by looking at The Cake Slice Bakers! 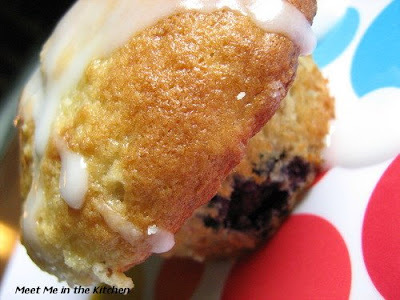 Coming on Thursday- My pick for Craving Ellie in My Belly!